Louisiana Governor has declared a state of emergency to exist statewide, following the current life-threatening round of flooding and escalating threats of additional destructive deluge. Louisiana, USA. Louisiana Governor has declared a state of emergency to exist statewide, following the current life-threatening round of flooding and escalating threats of additional destructive flooding. SPC tornado and severe weather map 20-21 March 2012. 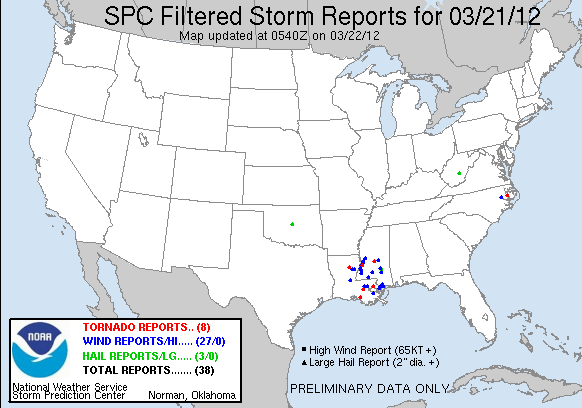 SPC received at least 11 tornado reports in Louisiana on Tuesday and Wednesday. Parishes throughout the state of Louisiana including Acadia, Ascension, Beauregard, Calcasieu, Claiborne, Jefferson Davis, Natchitoches, St. Charles, Union, Vermilion, and Vernon had already declared states of emergency following yet another round of severe weather and widespread destructive flooding. 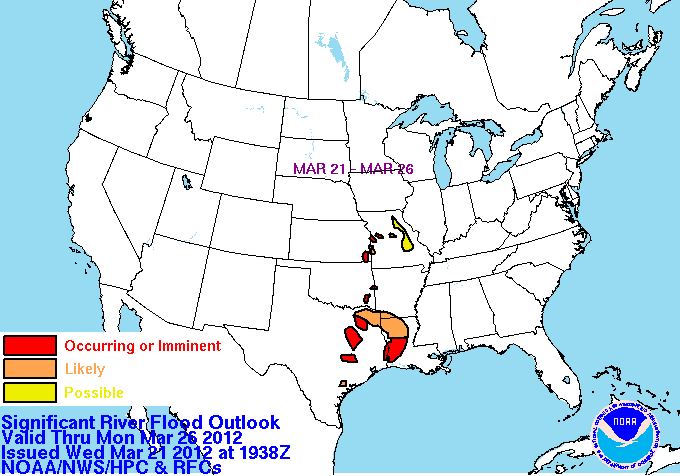 Significant River Flood Outlook, March 21-26, 2012. “… beginning on Tuesday, March 20th and predicted to continue through Thursday, March 22nd, a series of strong thunderstorms passed over the State, depositing up to 6” of rain and generating tornadic activity throughout the State, many in areas which are still recovering from the severe weather and flooding which occurred a mere week ago and resulted in the issuance of a separate statewide emergency proclamation –20 BJ 2012,” Gov. Jindal said in his state of emergency proclamation. The state of emeregncy will remain in effect for 30 days from Wednesday, March 21, 2012 to Friday, April 20, 2012, unless terminated sooner. Mexico Quake Update. The 7.4Mw quake has destroyed about 150 homes and damaged about 1,250 buildings. Most of the damage occurred in the municipality of Ometepec in Guerrero, near the quake’s epicenter. At least 11 people were reportedly injured; no fatalities reported, as of posting. The worst hit place was the village of Huixtepec, where nearly half of the buildings were severely damaged, reports said. Oregon, USA. Klamath County commissioners in Klamath Falls, Oregon, have declared a drought emergency. The Klamath Basin, which straddles the Oregon-California border, has ongoing “trouble meeting the water demands of the 11,400 farms on a federal irrigation project,” a report said. California. Marin County officials have declared a drought emergency, a report said. “This resolution will recognize an emergency drought condition exists and continues to develop in Marin County,” county Agricultural Commissioner Stacy Carlsen said, adding ranchers suffered a “50 percent loss in livestock forage as a result of adverse weather conditions” including little precipitation. Chiang Mai, Thailand. “Haze from forest fires and airborne dust particles beyond safety levels still blanket the northern tourist city of Chiang Mai, affecting air traffic in the region,” the Thai News Agency reported. Wildfires intensified by drought are ravaging northern Thailand. Chiang Mai Airport is using runway lights during daylight hours because of poor visibility. About quarter of a million people have sought medical treatment for air pollution-related illnesses, including respiratory and coronary heart disease, said the report. Colorado, USA. A massive wildfire on Colorado’s eastern plains consumed more than 84 square miles, forcing at least 1,000 residents to flee their homes in a small Colorado town of Eckley, Yuma County, and killing an undetermined number of farm animals and wildlife. “Things are expected to worsen by the weekend, with high fire danger in eastern Colorado, southeast Wyoming and far western Nebraska and South Dakota,” a report said. Marquette, Mich., recorded 78ºF, which was 22 degrees higher than the old record of 56ºF set in 1976, NWS reported. Milwaukee, WI. New Record: 83 degrees; previous record: 77 degrees (1921). Ancient volcanoes in Upper Midwest reawakening?